Spray Foam Systems are performance-based “GREEN” products for use in a variety of Spray Foam Insulation, Roofing and Waterproofing applications. Spray Polyurethane Foam, commonly referred to as "Spray Foam" or "SPF", has many uses and applications. The most common being Insulation, Roofing and Dome style homes/hurricane shelters. Spray Foam offers better insulation value and eliminates air infiltration, which is as much as 40% of normal energy loss. 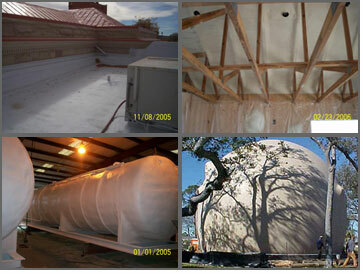 Spray Foam provides a continuous air barrier for your building envelope. The multiple benefits of Spray Foam make this system the High Performance, time-tested insulation of choice. To speak with someone about "Spray Foam" Contact Us. More successful today than ever before, widely recognized as the industry standard, Spray Foam continues to surpass expectations for cost-savings, durability and longevity. Spray Foam saves you money and pays for itself. The importance of being educated in the products available in todays quickly advancing market can make a considerable difference in the consumers' final satisfaction and realization of all the benefits available within the scope of specific products properties. Closed-cell & Open-cell WHAT'S THE DIFFERENCE? Closed-cell foam is rigid and structural. These qualities are achieved by its “closed-cell” construction. Each individual closed cell incorporated in the sprayed product attaches to its neighboring cell creating a “honeycomb” effect that structurally enhances virtually any surface that it is applied to. Open-cell foam is flexible and light weight. These characteristics are achieved by its “open-cell” construction. Open-cell foam shares, along with a comparable “R” value, the light weight and easily compressed characteristics of cellulose and fiberglass insulation. The greatest advantage over these other products is that the foam is seamlessly sprayed in place, more effectively fighting the free migration of air and moisture. Some advantages of closed-cell foam compared to open-cell foam include its strength, higher “R-value, and its greater resistance to the leaking/migration of air or water vapor. The “Proclaimed” negative aspect of closed-cell foam is its, apparently, greater cost. Being that closed-cell foam achieves double the “R” value assigned to open-cell foam; the application of simple mathematics quickly dispels the proclaimed drastic price difference. The choice of foam should also be based on requirements for the other enhanced performance advantages and “application specific” characteristics such as adding strength, reducing “rack & sheer”, moisture & gas vapor transmission control, available space, and the continued attention to inhibiting mold growth.